We buy most iPhones, Smartphone, Tablets and more in minutes! Interested in selling your old iPhone, iPad or smartphone? Let us buy it from you! Gophermods offers cash for phones, tablets, laptops and other electronic devices.The process is quick and painless. Simply answer a few questions about your electronic device, accept our offer, and receive same-day in-store payouts. Visit Gophermods to receive an honest market-value offer and cash in your pocket today! Remove iCloud: Unassign any Apple ID associated with the device. Charge Device: Allows us to more quickly test and verify device functionality. Additional Accessories: Bring any additional accessories for maximum payout. Disconnect Service: Ensure device is not enrolled in any active service. Provide us with some details in the form below, and we’ll message you with a quote. Seven Minnesota locations, chances are there is a Gophermods within a few minutes of you. Most buybacks only take a few minutes without an appointment. Simply walk-in to any of our locations and we will make an offer for your phone or device. You choose to accept it! All devices we purchase are flashed and wiped of any personal information from the previous owner. Know that your information is safe! We will offer payment on the spot for your device, no matter the condition of your phone, working or not! When we receive these used devices, our expert repair team will refurbish them then, we re-sell them directly to the public, with no middle man ensuring the highest payouts! Receive an extra 5% payment when you select an instant Amazon Gift Card as a payment offer. Do you have a device graveyard in your junk drawer? 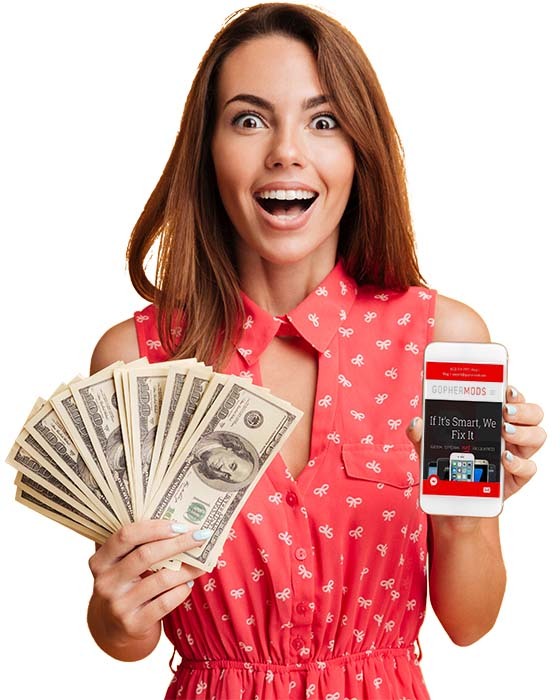 We are here to help you turn those old devices into cash on the spot!